Pre-heat the oven to 180*C. Line a 8" round cake pan with parchment paper. In a bowl, whisk together flour, ground almonds, baking powder, baking soda and orange zest. In a separate bowl, beat the butter with sugar until it is light and creamy. Add the eggs- one at a time. Beat well after each addition. Mix in the vanilla and the orange juice. In batches, carefully fold the dry ingredients into the wet ingredients. Do not over mix. Mix only until everything is well combined. Transfer the batter into the prepared pan. Top with flaked almonds. Bake at 180C for 30-35 minutes or until a skewer inserted into the center comes out clean. 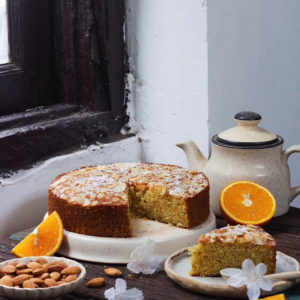 Your best orange almond cake is now ready!